It is getting cooler and cooler. Sorry – I mean that Global Warming is an imminent treat to humankind. So I thought I dive into it. As usual I thought it would be interesting to look at the recent August US temperature from a “historic” perspective. To see how the decade trends have evolved during the last 112 years. Especially to see how the decade trends have evolved during the last 42 years. The period that according to the Global Warming Hysterics and computer models they worship should show a steady and accelerated increase in temperature. 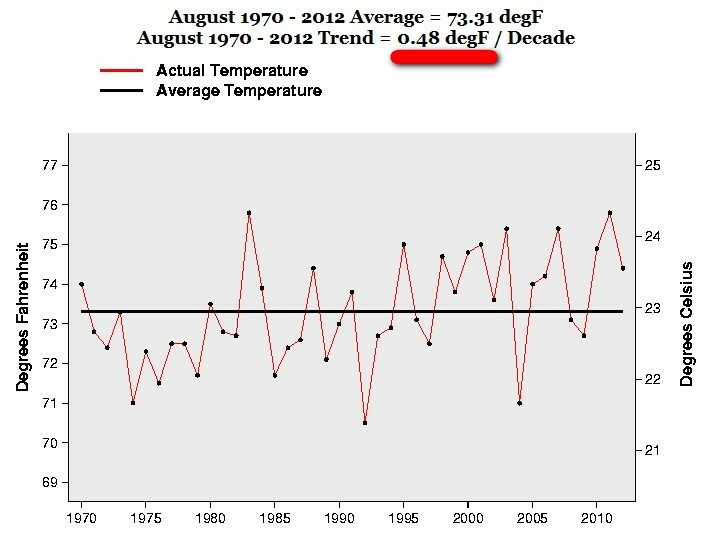 So the “warming trend” 2000-2012 for August is exactly 0.22 F degrees a decade. That is a 2.2 F warmer in 100 years. That’s what I call “warming”! Noticing the “accelerated warming” trend?? Even worse, “our” politicians, “scientists”, “journalists” and the mainstream medias attitude is: Move on, NOTHING to see here. As I have been saying all along, it has always been a political agenda – anti human, anti freedom, anti development and anti capitalism. And this Global Warming Hysteria is part of that agenda. It has nothing to do with science, facts or saving the environment or the Earth. 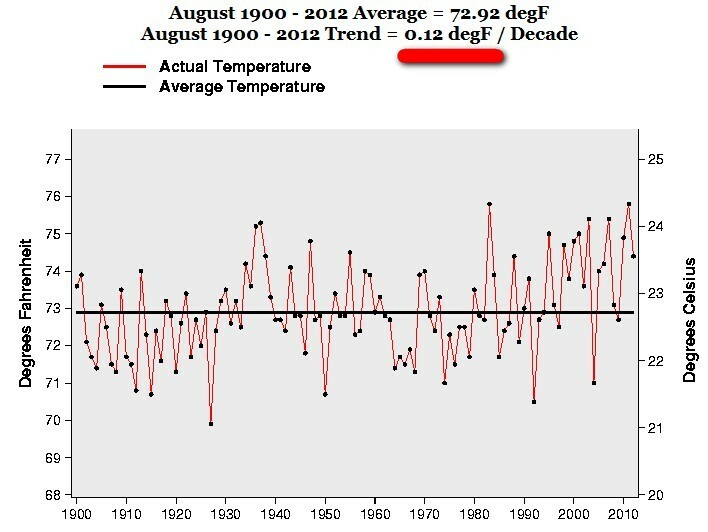 The August trend 1970-2012 is exactly 0.48 F degrees a decade. 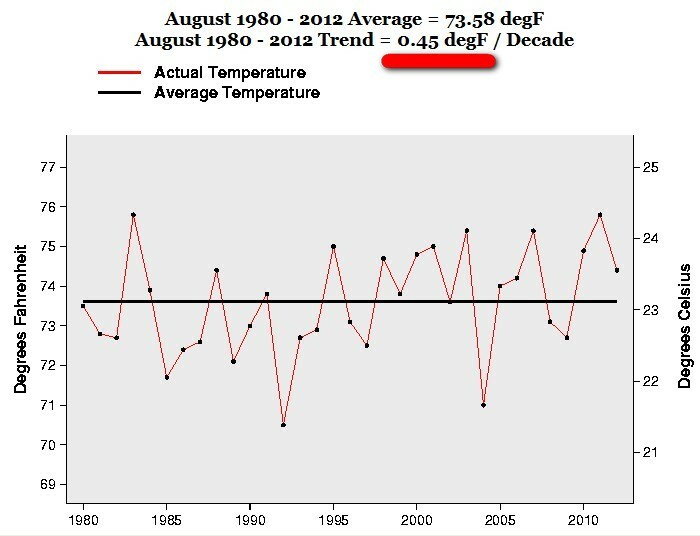 The August trend 1980-2012 is exactly 0.45 F degrees a decade. 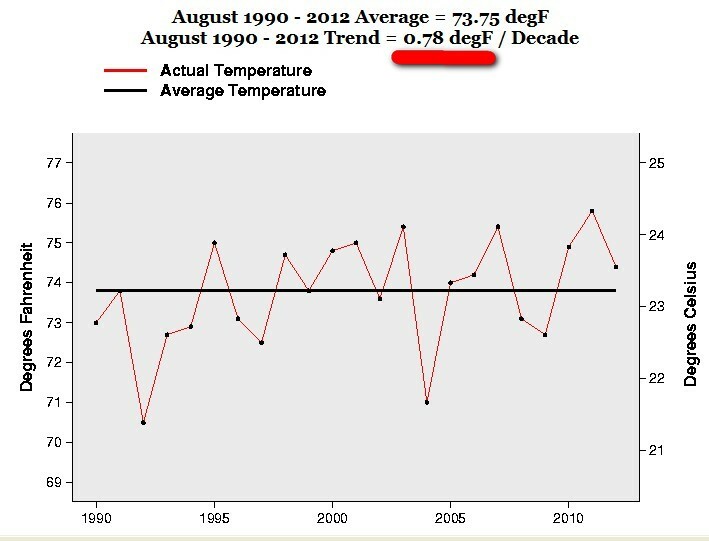 The August trend 1990-2012 is exactly 0.78 F degrees a decade. 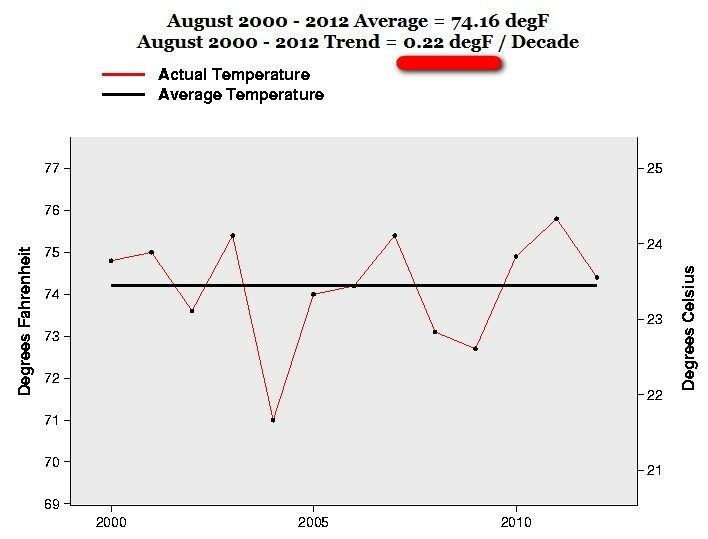 The August trend 2000-2012 is exactly 0.22 F degrees a decade. Another brilliant and glorious example of RAPID WARMING and an eminent treat to humankind! Especially during the last 42 years. This entry was posted on 11 september, 2012 at 8:51 e m and is filed under Fri- och rättigheter, Miljö - Environment, US Temperature, USA, Yttrandefrihet. You can follow any responses to this entry through the RSS 2.0 feed. You can leave a response, or trackback from your own site.